The Borghese embodies old-world majesty and opulence. The meticulous gardens are beyond compare and the units and equally stunning. 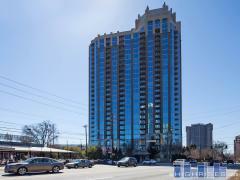 This Buckhead high-rise is as exclusive as the neighborhood surrounding it. The Borghese is unique for its truly European styling, topped off with sophisticated touches. Residents have the exclusive use of a fitness center, heated outdoor pool, valet, executive services, catering kitchen, men’s and women’s saunas, concierge and 2 restaurants with room service. The homes are artful in their design from the chandeliers, moldings, floors and grand windows to the floor plans and large balconies. Have any comments or questions about The Borghese? Ask your question and/or share your thoughts about this Building.